Related to the Pizza family, a Focaccia is quite popular in Italy and is usually seasoned with olive oil and herbs, topped with onion, cheese and meat, or flavored with a number of vegetables. Not sure how popular this one would be though with a price tag of AU$300! With every ingredient imported, this give the customer a true taste of Italy. YOU better be a bread-winner if you want to take a bite out of this fancy focaccia. The Focaccia Cecchio Impero Romano - signature dish of the SkyCity's new Il Piatto restaurant - will set diners back a cool $300. 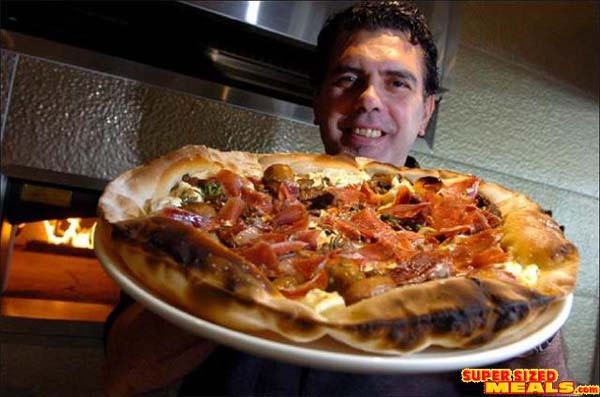 Head Chef Paolo Milanesi said that he wanted to "educate" Australians about the culinary arts. "Many people don't know what Italian food tastes like. We want to educate people," he said. "It's not about spices. It's about being fresh." Every ingredient on the focaccia has been imported. The prosciutto comes from a rare black pig in Spain - and restaurants must wait three years to order a leg. The goat cheese is 12 years old and there is a one-year wait for it. Mr Milanesi said one woman said it was not a "real Italian restaurant" because they did not serve chicken parmigiana. "Sometimes, people don't understand. That's not Italian. I'd never heard of this before I came to Australia," he said. "But people are starting to understand our philosophy. We use fresh food, with a real taste of Italia." He said the focaccia cost $300 because he only used the best ingredients. Even the flour was imported. "You need to love food and taste to be a chef." Mr Milanesi said all the best chefs use fresh ingredients. "There's a new way of cuisine. Every day they buy fresh ingredients," he said. In the two weeks Il Piatto has been open, six people have ordered the focaccia, but many more have ordered a $100 pizza - which includes wagyu beef, fresh truffles and lobster. But Mr Milanesi warned that he has only just started. "I'm not going to show you my real menu," he said. "Once people start to understand what we're doing, we'll move on to something bigger."